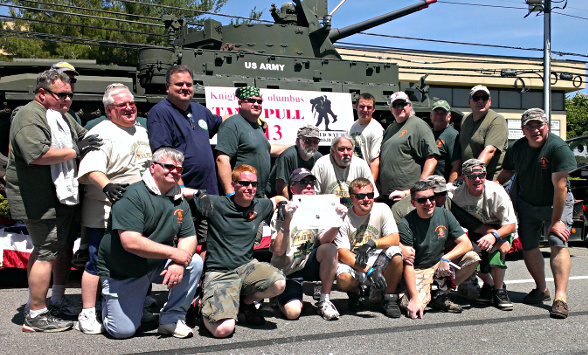 Members of Monmouth 2 joined brothers from Bergen 32 to participate in the 3rd Annual Wounded Warrior Tank Pull. The event is organized by the KofC in Clifton and raised over $70,000 for Wounded Warrior Projects to benefit wounded service men and women. The event places a tank on a flat bed tractor trailer and teams must pull the 80,000lb tank + truck 12 feet. The competition has three categories: fastest time for a team of 20, lowest combined weight of pullers, and fund raising. The AOH teams finished in respectable 13th and 14th places out of 35 teams in the timed competition. Monmouth 2 came in ahead with a time of 6.19 sec with Bergen 32 just a few hundredths of a second behind with a time of 6.25. Monmouth 2 finished 4th overall in the lightest weight pull thanks to the big guns on young brother John Lamar. He put his 232lb frame up against the 80,000lb tank and was able to pull the rig single handedly. Bergen 32 finished 4th in the category that helps the most; fundraising. They were able to raise $5,935 to help the Wounded Warriors. It was a great day for both Divisions to share in the friendship and unity while accomplishing Christian charity.